Roasting is my favourite way to prepare cauliflower and numerous other vegetables. This method causes the vegetables’ natural sugars to caramelize on the outside while the actual flavour of whatever is being roasted becomes more concentrated and delicious. This dish combines fabulous flavours and textures and visual appeal. 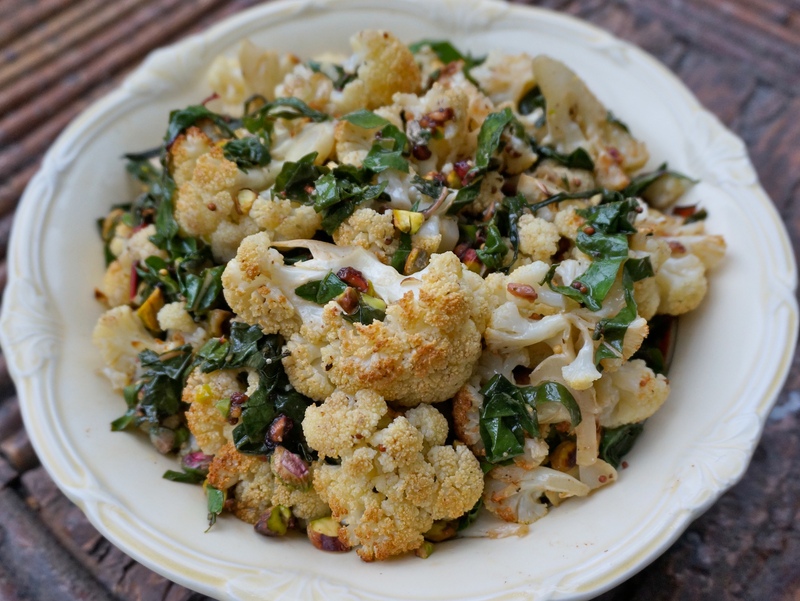 One of the beauties of this recipe is that the roasted, hot cauliflower wilts the chard, so no stovetop cooking is required. The nuts can be toasted in the oven for a few minutes before the cauliflower goes in. Ground sumac can be purchased in Middle Eastern food shops and in many supermarkets. Its lemony flavour makes it a great staple pantry item. Makes 4 to 6 side-dish servings. Line a baking sheet with parchment paper. Brush the paper with 1 1/2 tablespoons of the oil. Place the cauliflower onto the paper in the pan in a single layer, cut-side down. Drizzle the cauliflower evenly with 2 tablespoons of the remaining oil. Bake in a 425º F oven until the cauliflower is golden on top and lightly browned on the underside, 25 to 35 minutes. In the meantime, in a small bowl, whisk together the vinegar, mustard, cumin, salt, sumac (if using), pepper and cayenne. Slowly whisk in the remaining oil. Whisk in the honey. Place the chard into a large bowl. When the cauliflower is done, transfer it immediately to the bowl with the chard. Add the vinaigrette and toss to coat well. Stir in the pistachios and pomegranate seeds. Taste and adjust seasonings if needed. Serve warm, at room temperature, or chilled. This recipe was originally published in Edible Toronto magazine’s Fall 2013 issue.